Foods and drinks that contain caffeine: Drinks containing caffeine such as coffee, or energy drinks can give you an energy boost if you're feeling tired. However, it's not recommended to drink caffeine after lunch (and especially near bedtime), as it can interfere with sleep by keeping your mind overactive. Foods with dark chocolate are also high in caffeine and should be avoided late in the day. Spicy foods: While spicy foods are delicious, eating spicy foods too close to bedtime can cause heartburn, indigestion, and acid reflux. Heartburn can be made worse while lying down as it allows the acids to rise up into the esophagus and burns the sensitive lining. Alcohol: Contrary to popular belief alcohol does not help promote sleep. While it can make you drowsy, it often disrupts sleep and can deter you from entering the deeper phases of the sleep cycles. 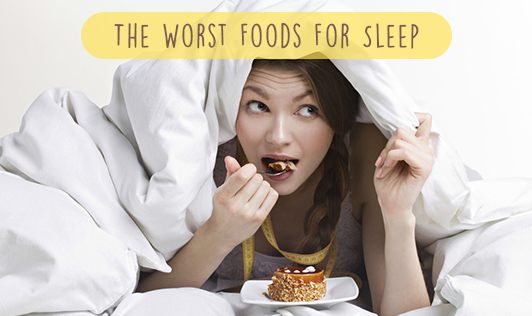 Foods high in fat have been linked to poor, fragmented sleep. Fat triggers the digestive processes and causes a buildup of stomach acids, which while lying down can get into the esophagus causing discomfort. A high fat diet also messes with the production neurotransmitters that help regulate your sleep/wake cycle. Heavy meals before bedtime: Eating too much of food before bed can cause you to lose sleep because your body is focused on digestion. If you are hungry before bedtime, a light snack is recommended. The best light snacks are those that contain tryptophan and calcium.